Sally McLean became Musical Director of the White Rosettes in January 1998. 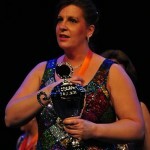 Since taking over the role, she has led the chorus to new heights, winning six national championships, and the hugely important European championship in 2009. 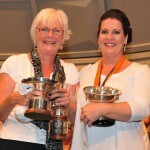 With Sally at the helm, the chorus has also had the honour of competing twice for the title of Llangollen Eisteddfod Choir of the World. It is Sally’s incredible musical ability, combined with her determination, ambition, leadership and motivational skills, that drives the chorus to ever greater achievements. 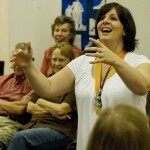 Sally is a committed educator both within and outside of the chorus. Sally acts as vocal coach to a significant number of both men and women’s choruses and quartets across the UK. Sally is an inspiration to other directors; her masterclasses with the White Rosettes have proved highly successful and she has been asked to present to the Association of British Choral Directors at their Annual Conference in August 2012. Joining the White Rosettes as a singer in 1982, Sally went on to win three national championships as a quartet singer: in 1987 with 42nd Street; in 1992 with Downtown Express; and in 2003 with The Jazz Firm. Sally says that every win is unexpected and every Championship a thrill but that none of it would be possible without her soul-mates David, Sadie and Molly.